Theoretically, batteries are simple. First developed in the late eighteenth century, batteries use chemical reactions to create a flow of electrons between two terminals that, when hooked up to a circuit, can be used to power everything from flashlights to cars. You can make a battery from a lemon, a galvanized nail and a piece of stripped copper wire. Touch your tongue to both the nail and the wire, and you’ll feel the gentle tingle of a weak electrical current. It’s not (quite) rocket science. Except we don’t – because batteries, especially the rechargeable lithium ones in vehicles and cellphones and computers, aren’t actually that simple, at least when you want them to do more than make your tongue tingle. That’s because you can have a battery that charges fast but is too heavy to be usable. Or you can have a battery that’s lightweight, but prone to overheating. You can have a battery that’s really energy-dense but made of toxic materials. You can have a battery that lasts a hundred years – but only if you keep it at 20 degrees Celsius. And so on. As the old saying goes, out of fast, cheap and good, you can only pick two. 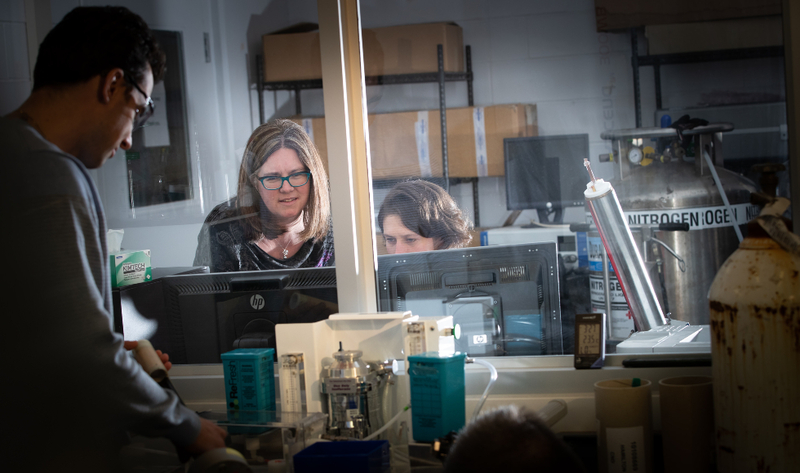 Goward is trying to address these challenges in her Magnetic Resonance and Materials for Energy Storage lab, where she and her students use a technique called nuclear magnetic resonance to study how lithium and other types of batteries and fuel cells work at a fundamental level. Similar to a hospital MRI, NMR allows Goward and her team to see how lithium nuclei change as a function of battery cycling, age, temperature or choice of materials. While an imaging device like an electron microscope would give Goward a static picture, NMR allows her to see how things change and move in real time, on the battery itself. It’s a capability that only half a dozen in the labs in the world have, and Goward’s lab is right out on the leading edge. That’s an interesting place to be for a researcher who, when she started at McMaster as an undergraduate in 1991, figured she was going to be a medical doctor – until a chemistry professor in her fourth year got her interested in solid-state chemistry. That led to starting grad school in 1995 at the University of Waterloo with Linda Nazar. Nazar’s lab had just started working on lithium batteries, which Sony had patented four years before, and a side project in NMR turned into Goward’s PhD project. Following a postdoc fellowship at the Max Planck Institute for Polymer Research in Mainz, Germany, Goward made her way back to McMaster in 2002 – the only woman on faculty in her department at that point. Goward is hesitant, though, to emphasize gender too much when it comes to her work. Goward, who maintains a 50-50 ratio of male and female students in her research group, suggests there are a couple of key points where it’s possible to address the challenges of attracting more women to science. For Goward, the best part of her work is showing students that chemistry is an ever-evolving field of discovery. She’s not teaching undergrads right now, but says her research group is an ideal place for her grad students to stretch their interests.